Manufacturer of a wide range of products which include compressed air piping and compressed air system piping. The purpose of the Compressed Air Piping is to deliver compressed air to the points of usage. The compressed air needs to be delivered with enough volume, appropriate quality and pressure to properly power the components that use the compressed air. Compressed air is costly to manufacture. A poorly designed compressed air system can increase energy costs, promote equipment failure, reduce production efficiencies, and increase maintenance requirements. It is generally considered true that any additional costs spent improving the compressed air piping system will pay for themselves many times over the life of the system. 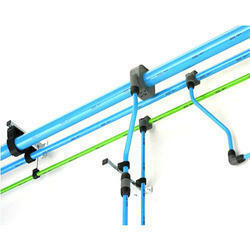 The main header pipe in the system should be sloped downward in the direction of the compressed air flow. A general rule of thumb is 1” per 10 feet of pipe. The reason for the slope is to direct the condensation to a low point in the compressed air piping system where it can be collected and removed. Looking for “Compressed Air Piping System”?